Brother of Violet Mary Heath (1882-1904) and Lt. Col. Frederick Dunbar Heath. Thanks to Mary Hustings from Coldharbour Local History Group for letting us reproduce this information on Captain Raymond Heath’s Memorial Window. The beautiful stained glass window at the West End of Christ Church Coldharbour commemorates Captain Raymond Leopold Greig Heath, who was killed in action leading his men at the Battle of Loos on 25th September 2015. He was 30 years old. He had already been seriously wounded in 1914, but returned to France after only 3 months. He had already been seriously wounded in 1914, but returned to France after only 3 months. 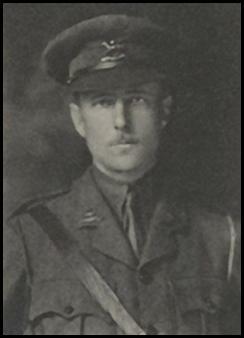 Captain Heath was the son of Arthur Raymond Heath and Flora Jean Baxter of Kitlands, a nephew of Cuthbert Eden Heath, and grandson of Admiral Sir Leopold Heath of Anstie Grange. The window was commissioned by Capt. Heath’s family from C E Kempe and Co and installed in 1923. Details of the commission, including an outline sketch, colours and figure sizes, can be found in the Kempe and Co. Commission Book at the Victoria and Albert Museum archive. The subject of the window is a Celebration of Holy Communion on the Battlefield of France. The badge of Captain Heath’s regiment, the Queens Regiment, appears in the tracery. Charles Eamer Kempe was a distinguished and important designer of stained glass in churches and cathedrals nationwide, and also of church furnishings, and houses. His secular commissions included work at Wightwick Manor, now owned by the National Trust, and Temple Newsam nr. Leeds. There are memorials to Kempe in Chichester and Southwark Cathedrals. Our window has a characteristic Kempe landscape background, reminiscent of 15th and 16th century Flemish and German glass from which Kempe took inspiration. The colours are rich and faces typically soft and expressive. The window is signed with C.E. 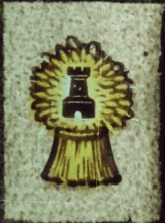 Kempe’s single wheatsheaf, enclosing a black tower, the symbol of his partner and distant cousin Walter Tower.